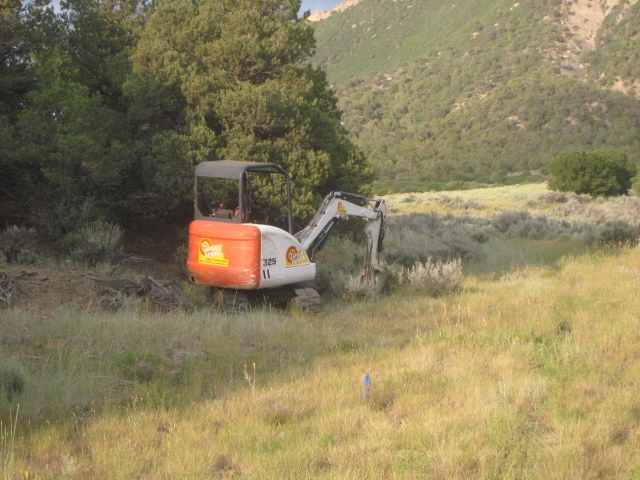 The excavator used on the project was seen Sunday at the bottom of the big meadow in Horse Gulch. 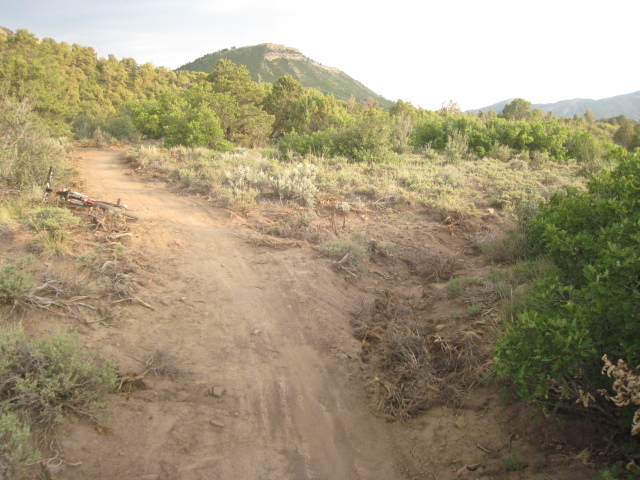 It was used to pull mounds of dirt onto the old Stacy's Loop in order to obstruct it as a usable trail. Small gamble oak that was cut to make the new trail was used to divert people away and cover the old Stacy's Loop. With good intentions, Trails 2000 organizers intended to re-route Stacy’s Loop in order to improve drainage, flow and contour in order to make for a more sustainable trail by reducing ruts from summer thunderstorms. 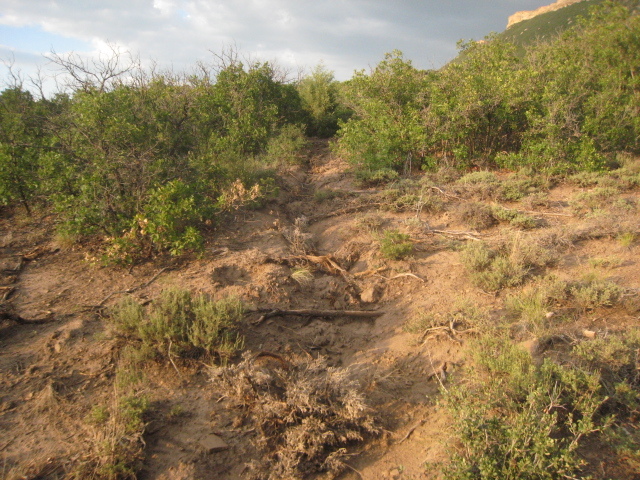 Durango’s Director of Natural Lands, Trails and Sustainability Kevin Hall said the old Stacy’s Loop presented a safety issue because of how eroded it had become from rains. 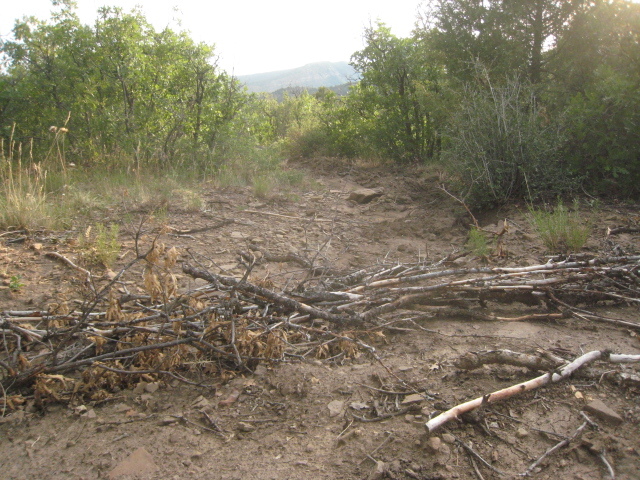 Sage brush, sticks, rocks, and mounds of dirt pulled out of the ground by an excavator were used, in addition to gamble oak cut for the new trail, to cover up the old Stacy's Loop. The new rerouted Stacy's Loop is seen in this picture with the old, covered-up route leading off to the right. This blogger encourages readers to contact Mary Monroe or Daryl Crites of Trails 2000 to request that the group never uses heavy machinery in Horse Gulch again, regardless of their trail construction needs (info@trails2000.org). Also, readers are encouraged to contact Durango’s Natural Lands, Trails and Sustainability Director Kevin Hall (hallks@ci.durango.co.us) and encourage him not to allow any more heavy-handed single-track re-routes in Horse Gulch using heavy machinery. If motorcycles aren’t allowed on City open space purchased with GOCO money, neither should excavators or other heavy machinery, with the exception to those used for the suppression of wildfires. Hall also spoke about the prospect of developments he thinks the community supports at the trail heads to Horse Gulch. As for the recent decimation of Stacy’s Loop, please join me in speaking out against this atrocity and oppression of a smile-inducing trail that many of us used to love.